Bad news: According to S&P/Case-Shiller, month-over-month Washington, DC metro area seasonally-adjusted home prices rose 0.08% in April. Non-seasonally-adjusted home prices rose 0.8%. For the Composite-20 average, seasonally-adjusted home prices fell 0.09%. Prices continued to fall in the four heavily-battered states of California, Florida, Nevada, and Arizona. Inflation from March to April was 0.24%. If Florida prices keep falling while DC prices start rising, I think I'm going to have to live where summer lasts all year long. The Conference Board Leading Economic Index attempts to forecast upcoming changes in the economy. Notice the slight uptick over the past two months. Economist and blogger Rebecca Wilder notes more signs of recovery here and here. Hat tip: Calculated Risk. Original source. So, here I am on a cloudy Sunday afternoon assembling a new multimedia storage cabinet while flipping through the TV channels. I noticed one of those REDC home auction infomercials but was surprised when they mentioned a home in Stockton. "I didn't know there's an area called Stockton here in the Washington, DC metro area," I thought. The home being auctioned was actually in Stockton, California. I very quickly realized that all the homes in the infomercial were in Northern California. Apparently, REDC was accidentally airing a Northern California version of their infomercial here in the DC area. Oops! I can't imagine many people in the DC area want to run out to a Northern California home auction. That looks like a half-hour's worth of advertising dollars wasted. Update: REDC has been running the same Northern California ad on multiple channels, so either it's intentional (I can't imagine why) or someone really screwed up. There are many great reasons to audit the Federal Reserve. Eight months late, The Wall Street Journal copies me. Fewer Americans are moving now than in any year since 1962, when the population was 120 million smaller. "The economy is playing havoc, since property values have dropped significantly in the last few years," Hicks said. "Many people simply cannot just pick up and move. They have a home they have to sell first. 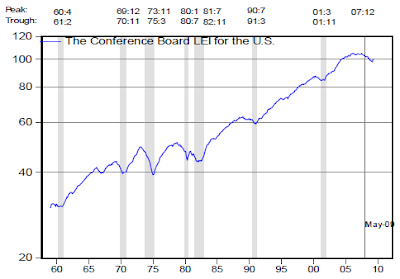 One of the justly celebrated strengths of the United States economy is its labor mobility. By this account, at least, our housing market has basically destroyed that critical asset. A recession like this is the worst time to lose your labor mobility. Together with the enormous increase in household wealth over the past 20 years, healthy income growth will help propel residential spending to new heights. The household wealth argument is a circular argument, because household wealth is strongly determined by housing prices and stock prices. As Rebecca Wilder recently pointed out, household wealth hasn't been doing so well recently. The Mortgage Bankers Association today significantly lowered its 2009 mortgage origination forecast to $2.03 trillion, a drop of $700 million below its March projection. The primary reason: higher interest rates. Interest rates climbed from 5.19 on March 25 to 5.76 on June 17, according to Bankrate.com. Rising interest rates have put a serious damper on refinancing. When will housing prices bottom? Market bulls believe home prices could bottom in the second half of 2010, but the bears warn it could be 2013 before they finally trough. And once prices do reach a low, it could be years before they significantly rebound. As far as I'm concerned, you will usually have free speech on this blog, but if you are nasty toward others, post link spam, or I suspect you are engaging in sockpuppetry, I may delete your comment. If you want to hold other commenters accountable for their previous statements on this blog, then at least have the courage to choose a consistent and unique username for yourself (other than "Anonymous") so you can be held accountable as well. If you make snide remarks towards others, your comment may be deleted. If your comment is offensive or disagreeable in general, your comment may be deleted. If you attempt to hold others accountable for their previous statements while you cowardly hide behind the username "Anonymous", your comment will definitely be deleted. In short, the five seconds you save by not using a unique and consistent username will substantially increase the odds that your comment will be deleted. Google Maps Street View is a solid tool for quickly acquiring a visual perspective of a block or a neighborhood. Street View is a great service. Business Week has a solid article about housing prices in the coming years. "By 2012 we may finally get back to blissful boredom. With any luck, three years should be long enough for the U.S. economy to recover and for the nation's housing inventory to shrink to more normal levels." "Prices? While they're likely to keep falling a while longer under the weight of foreclosures, the market is definitely closer to the bottom than the top." In most bubble markets, a bottom in terms of prices is not here yet as prices will continue to fall over the coming months and into 2010. After that I expect a long period of very low price growth. 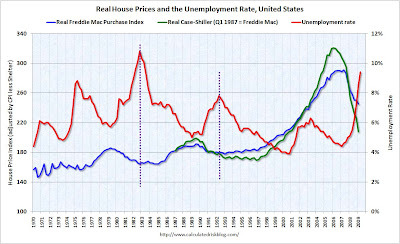 Current buyers would be foolish to expect a quick jump and return to 2005 & 2006 prices. Values have fallen even along the coastal submarkets that were once seen as mostly immune from the collapse in home prices elsewhere. Now, while signs of a recovery mount in some of the most distressed inland markets, declining values along the coast are just beginning to lead to short sales and foreclosures in mid-to-upper end housing markets. Flashback 2002: "Alan Greenspan needs to create a housing bubble"
The basic point is that the recession of 2001 wasn't a typical postwar slump, brought on when an inflation-fighting Fed raises interest rates and easily ended by a snapback in housing and consumer spending when the Fed brings rates back down again. This was a prewar-style recession, a morning after brought on by irrational exuberance. To fight this recession the Fed needs more than a snapback; it needs soaring household spending to offset moribund business investment. And to do that, as Paul McCulley of Pimco put it, Alan Greenspan needs to create a housing bubble to replace the Nasdaq bubble. Judging by Mr. Greenspan's remarkably cheerful recent testimony, he still thinks he can pull that off. As Mr. McCulley predicted, interest rate cuts led to soaring home prices, which led in turn not just to a construction boom but to high consumer spending, because homeowners used mortgage refinancing to go deeper into debt. All of this created jobs to make up for those lost when the stock bubble burst. Now the question is what can replace the housing bubble. 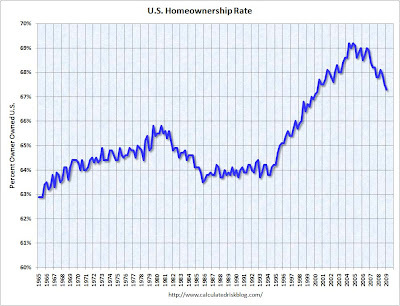 Nobody thought the economy could rely forever on home buying and refinancing. But the hope was that by the time the housing boom petered out, it would no longer be needed. But although the housing boom has lasted longer than anyone could have imagined, the economy would still be in big trouble if it came to an end. That is, if the hectic pace of home construction were to cool, and consumers were to stop borrowing against their houses, the economy would slow down sharply. If housing prices actually started falling, we'd be looking at a very nasty scene, in which both construction and consumer spending would plunge, pushing the economy right back into recession. That's why it's so ominous to see signs that America's housing market, like the stock market at the end of the last decade, is approaching the final, feverish stages of a speculative bubble. OK, Paul Krugman is citing Paul McCulley of PIMCO, but still... I just don't know what to think about this right now. Thoughts from readers? Krugman was mainly expressing pessimism. He was not cheerfully advocating a housing bubble, but instead he was glumly saying that the only way he could see to get out of the recession would be for such a bubble to occur. ... In the event, we had a housing bubble and we got out of the recession. To me, this raises the question of whether a distorted recovery is better than an undistorted recession. Yes. It is true! My wife and I bought a townhouse in the inner part of Silver Spring, MD. * Prices are unlikely to fall much more in our new neighborhood. Our purchase price is about 20% lower from its peak price (nominally). Will prices in our neighborhood fall further? Most probably, I expect most parts of the Washington area to fall another 5 - 10% nominally. Despite this we decided to buy and do not regret our decision. Cramer's right as long as he ignores the actual data. House price changes for the largest 100 metro areas. REO rate among the largest 100 metro areas. Hat tip: News N Economics. As for single family, ... 50 percent of sales in May were on spec. ... So why all the spec now? Because builders are trying to jam all these homes into buyers’ pockets before the expiration of the $8000 first time home buyer tax credit. It turns into a pumpkin November 30th. The government and industry programs to ease foreclosures are not showing big successes. A lot of Alt-A borrowers are in big trouble and many won’t qualify for any of the bailout programs. With interest rates in the mid 5’s, refinancing isn’t going to do much of anything for many borrowers. There is no sign of abatement in delinquencies, and while investors are in there, using old-fashioned cash to eat up inventories of distressed properties, there are plenty more foreclosures in the pipeline just waiting to hit the market. U.S. home prices not so overvalued anymore? I've created a new graph, which compares national home prices to national owner-equivalent rents. These are not dollar values, but index values with Q1 1997 equal to 100. According to this graph, the national price/rent ratio is 10.7% higher than in Q1 2007. I haven't built a graph for the D.C. area yet, but running the numbers shows that the D.C. area price/rent ratio is 21.6% higher than in January 1998. (D.C. area rental data only goes back to December 1997.) Even worse, New York City area price/rent ratios are 38.2% higher than during January 1997. Of the twenty metro areas that the S&P/Case-Shiller Home Price Index tracks, New York and Washington are the slowest decliners. This is why I believe New York and Washington will bottom later than the country as a whole. In the past I have argued that home prices don't overshoot, but the trajectory of the graph above suggests that in time I may be proved wrong. The current trajectory seems to suggest we are in for massive overshooting. You have to buy foreclosed homes or short sales to get the bargains, though. At least there's one place in America that's wearing like Teflon through the recession: Washington, D.C. Most corners of the economy may be struggling, but in the nation's capital it's boom times, baby. According to new data, the area's unemployment rate dropped to 5.6% in April from 5.9% in March. This is the second consecutive month of improvement for Washingtonians, and it's leagues from the national unemployment rate, which hit 9.4% in May. As [Senator Mark] Warner put it to the Washington Business Journal, "It helps to be where the money is." Sen. Johnny Isakson has reintroduced a bill that would give home buyers a tax credit worth 10% of the purchase price of a home up to $15,000. The Georgia Republican unsuccessfully tried to get the credit inserted into the $787 billion stimulus package that went into law in February. Congress instead opted for extending and boosting an existing credit, worth up to $8,000, for first-time buyers. That credit is set to expire Dec. 1. The proposed credit wouldn’t have income restrictions, unlike the current one, which phases out for individuals making more than $75,000 and couples making more than $150,000. Before serving in the Senate, Sen. Isakson spent more than 30 years in the real-estate industry. Again, these types of tax credits are inherently unfair. They effectively force other people to pay part of the cost of someone's home. This is an example of how Republicans lie when they say they believe in small government and the free market. The truth is they don't. This plan will add $35+ billion to the national debt in an effort to stop a much-needed housing correction. On the other hand, if you're thinking of buying now in order to get the current $8,000 tax credit, perhaps you should wait for a better deal. For anyone who's interested, here's an interesting article on America's chronic budget deficits. When the Treasury yield curve is steep (long-term rates much higher than short-term rates), it suggests a strong economy going forward. When the Treasury yield curve is inverted (long-term rates lower than short-term rates), it suggests a recession ahead. In late 2006 and early 2007, the yield curve became inverted. At the time, many pundits suggested that because of unique conditions, it may be a false positive. These pundits turned out to be very wrong. Now when pundits suggest that because of unique conditions, the currently steep yield curve may be a false positive, I am not inclined to believe them. Don't argue with the yield curve. Furthermore, few homeowners consider exiting the housing market for purely speculative reasons. ... In fact, most decisions to exit the market in favor of renting are not market-timing moves. Instead, they reflect the growing pressures of economic necessity. This may involve foreclosure or just difficulty paying bills, or gradual changes in opinion about how to live in an economic downturn. Even if there is a quick end to the recession, the housing market’s poor performance may linger. After the last home price boom, which ended about the time of the 1990-91 recession, home prices did not start moving upward, even incrementally, until 1997. 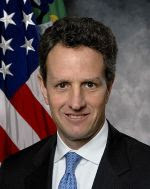 Real estate agents say Geithner recently rented out his Westchester County home after it didn't sell — even though he reduced the price to less than he paid. Geithner put the five-bedroom Tudor near Larchmont on the market for $1.635 million in February. Agents Scott Stiefvater of Stiefvater Real Estate and Debbie Meiliken of Keller Williams Realty say the house was rented for $7,500 a month on May 21, a few weeks after the asking price was dropped to $1.575 million. Here is his house on Zillow. The guy lives in a bubble (pun intended); Zillow says it's worth $200,000 less than his asking price. Let's do a little math. He's renting it out for $7,500/month, which is $90,000/year. Divide $1,575,000 by $90,000 and we get a price-to-rent ratio of 17.5. That might seem equivalent to a typical stock market P/E ratio, but it's not a price-to-earnings ratio. It's a price-to-sales ratio. So, the Treasury Secretary of the United States thinks his own house is worth 31.8 times the annual profits it can generate. He's willing to accept an earnings yield of only 3.14%. That's a horrible rate of return! Compare the 3.14% earnings yield with the 5%+ cost of a fixed rate mortgage. This guy is an economist? Hey, Tim, take the hint: You need to drop the price! For any conspiracy theorists out there who think the government intentionally under-reports job loss and unemployment statistics, I have decided to post job loss numbers from a non-governmental source as a follow-up to yesterday's post on the subject. 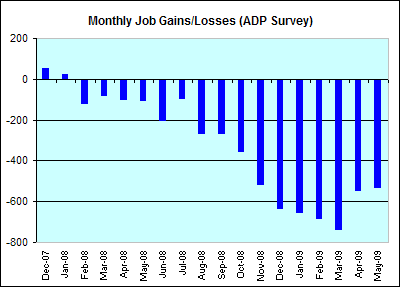 The graph below shows the job gain/loss estimates from the ADP National Employment Report. Note that although an individual month's numbers can be quite different between Automatic Data Processing and the U.S. Department of Labor, the overall trend has been roughly the same. 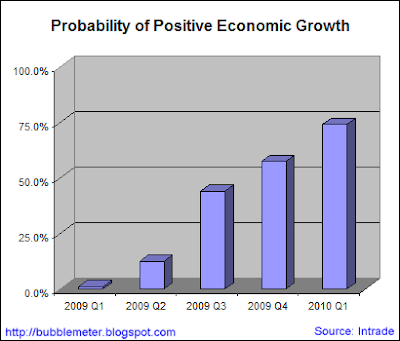 Based on the "US Economic Growth by Quarter" bets at Intrade.com, here are the probabilities that real GDP growth will be positive in a given quarter. It looks like people are expecting the recession to be over by the fourth quarter of this year, give or take a quarter. 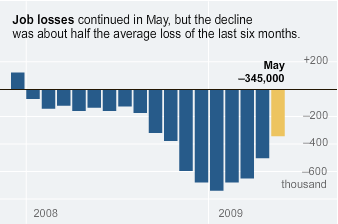 The number of new job losses per month is slowing, but the economy is still losing jobs. Even when job gains per month rise above zero, the unemployment rate is likely to keep increasing, because it takes about 100,000-125,000 new jobs per month just to keep up with population growth. 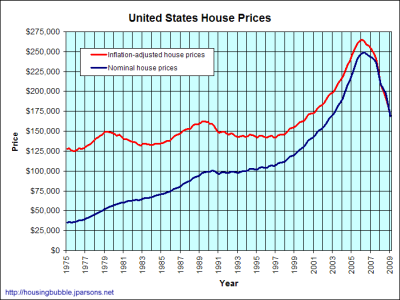 Two new housing/econ blogs have recently come to my attention: here and here. Real Estate Calculator estimates the post-bubble value of your home. Also, you may want to join the Facebook group called Let real estate prices fall! The plan offers up to $75 billion in incentives to lenders to reduce loan payments for troubled borrowers. Since it went into effect in March, some 100,000 homeowners have been offered a modification, according to the Treasury Department, though a tally is not yet available on how many offers have been accepted. That’s a slow start given the administration’s goal of preventing up to four million foreclosures. Over the past year or two, the government has come up with several plans to stop the wave of foreclosures. But, for the most part, these plans have done what government plans do best: Fail. You would expect price declines to slow before they stop. It seems that Jim Cramer is confused by the difference between housing sales and housing prices. With respect to yesterday’s in the mortgage market — yes, it is as bad as you can imagine. No call can be made on the near-term, however, until we see where this settles out over the next week of so. If rates do stay in the mid 5%’s, the mortgage and housing market will encounter a sizable stumble. The following is not speculation. This is what happens when rates surge up in a short period of time — I lived this nightmare many times. Yesterday, the mortgage market was so volatile that banks and mortgage bankers across the nation issued multiple midday price changes for the worse, leading many to ultimately shut down the ability to lock loans around 1pm PST. This is not uncommon over the past five months, but not that common either. Lenders that maintained the ability to lock loans had rates UP as much as 75bps in a single day. Jumbo GSE money — $417k - $729,750 — has been blown out completely with some lender’s at 8%. I have seen it all in the mortgage world — well, I thought I had. The consequences of 5.5% rates are enormous. Because of capacity issues and the long time line to actually fund a loan in this market, very few borrowers ever got the 4.25% to 4.75% perceived to be the prevailing rate range for everyone. At the time I'm writing this, mortgage rates are 5.32%, up from the high fours a few weeks ago. This raises a significant issue for bubbleheads: Prices are likely to keep falling for at least the rest of this year, but mortgage rates are likely to increase when the economy recovers. Rising mortgage rates will likely push real prices down further, but not enough to prevent monthly payments from rising significantly. The Fed's monetary policy also risks (but doesn't guarantee) significant inflation as the economy recovers. The Fed paper estimates that a 1-percentage-point increase in the unemployment rate boosts the chance of a 90-day delinquency by 10%-20%, and a 10-percentage point fall in house prices raises the probability of a default by more than half. A 10-percentage-point jump in the debt-to-income ratio, meanwhile, increases the chance of a 90-day delinquency by 7%-11%. Despite all the hand-wringing and attempts to contain the foreclosure plague, the problem still spread during the first three months of 2009, as the number of foreclosure actions started hit a record high, according to a quarterly report. The National Delinquency Survey released Thursday by the Mortgage Bankers Association (MBA), reported the largest quarter-over-quarter increase in foreclosure starts since it began keeping records in 1972. Lenders initiated foreclosures on 1.37% of all first mortgages during the quarter, a 27% increase from the 1.08% rate during the last three months of 2008 and a 36% rise from the first quarter of 2008. All told, more than 616,000 mortgages were hit with foreclosure actions. Delinquencies, the stage in which borrowers have fallen behind on payments but have not yet received foreclosure notices, also hit record highs, with the seasonally adjusted rate at 9.12% of all loans, up from 7.88% last quarter. 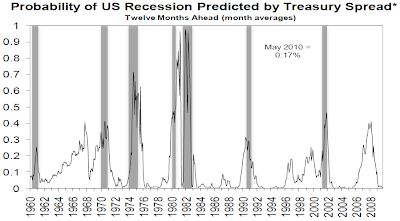 That said, it seems very likely that the current recession will be the longest since the Great Depression. 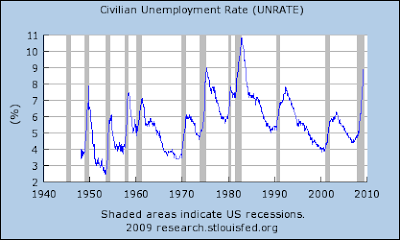 Even though it looks like the current recession may be on its last legs, the unemployment rate may very likely reach the second highest level since 1948, and could possibly go higher than that of 1982. 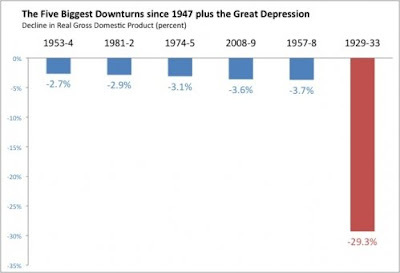 In the latter case, it would unambiguously be the worst recession since the Great Depression —But it would be a far cry from what our grandparents and great-grandparents experienced during the 1930s. Note: I notice that Cornell University (my parents' alma mater, BTW) law professor William Jacobson linked to a previous unemployment post of mine. I agree with his thoughts, so I encourage you to read his post.